Rather than calling this area Burr Farm, I think its better to call it the Dingle Brook Trails, since Dingle Brook makes up the northern boundry of the trail system. 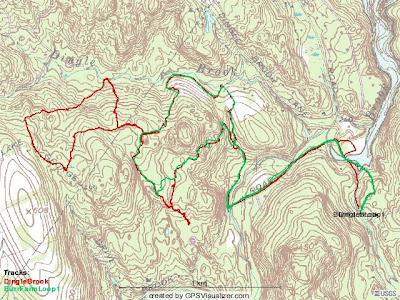 The first map below is the last two rides I did at Dingle Brook. 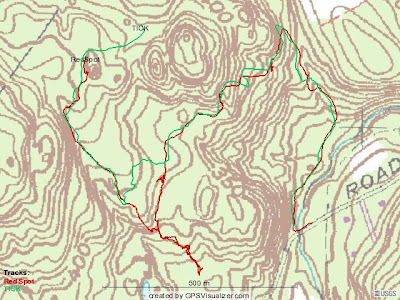 The track in red is about 6.5 miles long from Silver City and the green track is around 5.5 miles, so the loop down to the bench at Dingle Brook is probably only a mile. Below is a detailed shot of the southern end of the primary loop and the other day I found some red blazes (actually red spray paint) on some trees, so I decided to follow them and they led to someone's house off of Pond Brook. However, it makes a good connection to the trail that dead ends at the southern end of the property but going north it becomes a hike a bike. You can just make out before the red track meets back up with the green a little blip in the trail/track where I had to go around this huge tree that was uprooted, probably due to to that tornado we had a month ago. So, this might make an more interesting connection to the loop that I am no riding for my workouts and I need to explore this new area some more.